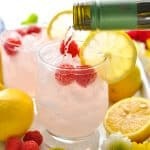 A light and bubbly Pink Lemonade Italian Spritz Cocktail is a refreshing way to enjoy a warm summer day! Best of all, you only need 3 ingredients for this fun and festive beverage that's perfect for picnics, pool parties, or lazy afternoons in the hammock! Place ice in a glass. Pour Prosecco and pink lemonade over ice. Stir gently to combine. Top off with a splash of soda water. Garnish with sliced lemon and fresh raspberries. Serving more than 1 person? Just multiply the ingredients to prepare as many beverages as you need. You can mix a big batch of Spritz in a large pitcher.